So you have decided to go with turf, but you aren't too sure on how to install sod? You have come to the right place. Sod installation doesn't have to be difficult, and with these 5 simple steps you will have your brand new lawn in no time! Once you have decided on your turf and had it delivered, you are now ready to install your new greenery. If you need help deciding on a turf variety check out our turf variety guide. The first step in our guide on how to install sod is very similar to many other landscape projects, start with a clean, level surface. In my experience if you have an existing lawn it is not always necessary to remove it, in order to install sod,as long as you can level the ground with some organic material. But remember you will need make the sod level with any edges such as walkways, driveways, or any other surface level with the ground. Though it is generally thought to be OK to lay sod over an existing lawn, some landscapers and homeowners prefer to remove any existing lawn before installation of sod. Using a glyphosphate like Round Up you can spray your existing lawn, and sod over the dead grass. If you live where rocks and roots are not an issue, you can use a tiller or bedscaper, to till existing grass into the soil. While your at it add some compost and fertilizer, and mix it in. This type of lawn preparation is timely, but may be the best way to really give your sod a head start. Now that you have prepared the surface its time to make sure that your edges are prepared properly. You may have already done this in step one of How to Install Sod, but if you have not be sure to now. Be sure that edges along any paths, parts of the driveway, or garden beds are dug down enough that when the sod is laid it will be even with the surface. Usually this will be about 1 inch below the fixed edge you are installing around. If you have not already, it’s time to fertilize. Fertilizing now will allow all of your fertilizer to get fully beneath the surface to feed the roots. Though you can add fertilizer after laying the sod, you may lose some of it due to runoff. Fertilizers are essential for a green lawn as they aid your new sod with nutrient uptake and improve the soils PH, which allows the roots to establish themselves deeper in the soil, leading to a healthier, happier, and greener lawn. 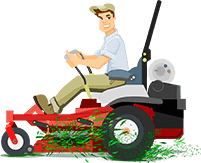 Your surface has been leveled and prepared, and it’s time to unroll your brand new lawn! Start with the longest fixed edge or any edge in the landscape that can not be moved e.x. garden beds, house, sidewalk etc. Using scissors, clippers or a knife cut your edge in, laying the sod parallel to the longest fixed edge. Finally water in your new lawn, and admire your hard work! Make sure you water in the new sod for at least one hour per day for the first 10 days, otherwise the investment in your new turf grass will most likely perish, as newly laid sod needs tons of water while it is "rooting" to your lawn. If you are installing your grass during the summer months, you'll need to double the watering to at least twice a day for a one hour duration to compensate for the high temperatures . Of course, if you're lucky enough to get some rain, you will not need to water on that particular day. Walk on your new lawn as little as possible, newly laid turf can be fragile for the first few weeks, especially when wet. Fertilize at least twice a year. Wait about 2 weeks before cutting the grass. Once your lawn is established, follow the Lawn Maintenance Guide to keep it in all its glory. That's it, now you see just how simple it is to install sod. With this easy to follow guide you to now know how to install sod like The Sod Father. Thanks to the Lawn Father for the Graphics check them out here.